Lady and the Blog → Contest → ENTER TO WIN: No Stain Is Sacred! – Win Two (2) 100oz Bottles Of Tide!! ENTER TO WIN: No Stain Is Sacred! – Win Two (2) 100oz Bottles Of Tide!! Whether it is a stain that you got on the first date with your spouse or a peanut butter stain that resembles Elvis, some stains may actually be worth keeping. 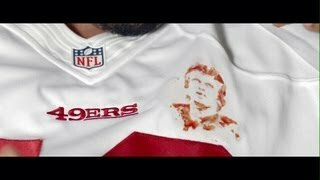 Well, at Tide, no stain is sacred…not even a Joe Montana stain! Remember this great ad from the Super Bowl. So funny!! I love when commercials actually deliver on the immense Super Bowl hype. You can check out this and so many other hysterical videos on Tide’s YouTube Channel!! How about the Stain Saver!! LOL! You know, as they say in Paris…Gracias! Keep up with all the latest on Facebook and Twitter, too! I get stains out of everything that I can. Tide helps though. No I don’t want to keep any stains. I don’t have a savable stain. I try to get them out of clothes as much as I can. I suppose most savable stains would either be blood, to remind you of an injury, or something related to children and their crafts. I haven’t encountered either at this point. Maybe some day on the blood stain though. I will keep my fingers crossed for a massive flesh wound worth remembering!!!! I do not have a savable stain. Once I spilled coffee, and it sort of looked like the shape of TX. I didn’t save it, though. A Coffee Stain I Know Tide Can Save ! I have all kids of stains with two growing boys! I get major coffee stains and my kids get major grass stains! I do not have a savable stain. 🙂 Thank you. No, no savable stain here! Well with three kids, there are stains everywhere and Tide is amazing at getting them out. Thanks for the contest! Ugh, no. Not a fan or saver of stains. I’m pretty obsessive about getting out stains. I’m going nuts right now – the plumbers were unable to fix my washer drain and the laundry is piling up! Living on a farm and plenty of animals in and out all day and night…sure I do.. I don’t have a savable stain. No stains worth saving here. No saveable stains…I like my laundry nice and clean every time. no, no savable stains here. I have a shirt that was signed (in Sharpie) by Penn and Teller. I don’t wear it anymore, though! I have a white sweatshirt that my daughter wore to softball practice and got hit in the mouth with a softball. I kept it as a reminder to always watch the ball! None here.Thanks for the chance. No savable stains, but do have stains on almost every shirt! most stains can be taken care of if you act fast. my daughter gets bloody noses, and if I take care of the stain right away it goes away, but if I don’t know about it or don’t get to it right away, there is no saving it. I don’t know about savable but we have lots of stains! No savable stains on me but my grandson is a different story! I don’t have any savable stains. My husband is an umpire for softball and baseball, and luckily most of the stains are very minor and manageable. No savable stains here, either! No savable stains… I love Tide though! No intentionally savable stains….but some that I just can’t seem to get rod of! My son always drops food on his t-shirts, normally when he’s wearing a new white one! I don’t have a salvable stain, but lots of others! I just saved my daughter’s shirt from an art mess she did at school by treating it as soon as she got home with Tide products. Thanks Tide! No saveable stains that I know of. I prefer to have stains disappear. I don’t have any stains that are saveable. No intentionally savable stains, only unintentional stains that stick around! No salable stain, but I’ve got the whole family’s clothes to wash! The only stain we have right now is pineapple juice on my daughter’s onesie. Although I’m sure if I dug through the laundry there’d be something. Nope, I don’t want any stains! Sadly, all stains must go. I have a granddaughter and grandson who play softball/baseball in upstate SC red clay. The granddaughter is a catcher. Need I say more. The uniforms have to last a season. Thanks for this giveaway We NEED it! I do not have any savable stains. I can’t think any savable stains!! No, I don’t have a savable stain. We have many saveable stains, especially oil stains, they are the worst! No, all stains can go! No I dont want to save any stain! No, all stains must go! No, they’re horrible. Esp. the grease stains. i do not have a saveable stain! i have to get them all out and right away!!! I have a blood stain on the measuring tape from when my daughter was measured after her birth. I don’t have any savable stains at the moment. No stains…I try my hardest to get everything out! I can’t say I have a savable stain. Do you have a “savable stain?” Please leave your email. My husband needs a bib to eat, I have lots of stains to get out. Don’t have a savable stain. All my stains are here to stay. Thanks for the giveaway… all stains must be washed, not saved ! No Savable stains in this house! I want them all out! I love tide, it’s my favorite detergent and I always buy it when it’s on sale…would love to win some for my families laundry. With a husband, kids and eight dogs, three of which are rescues, and occasional other rescue fosters here, I go through a lot of laundry detergent and do laundry every day so it would come in handy to win some. Thanks a million. No don’t think I do!